I've been wanting to share some fun projects that I have completed in our home recently. I think the crafty bug has been therapeutic for me the last few months. And I'm pretty happy with how most of them turned out. 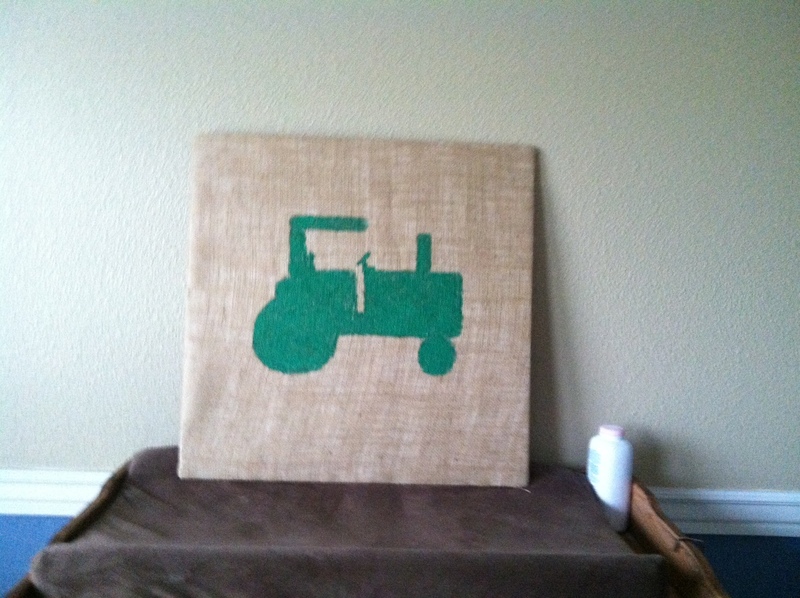 These were just a wild idea I got about painting burlap. 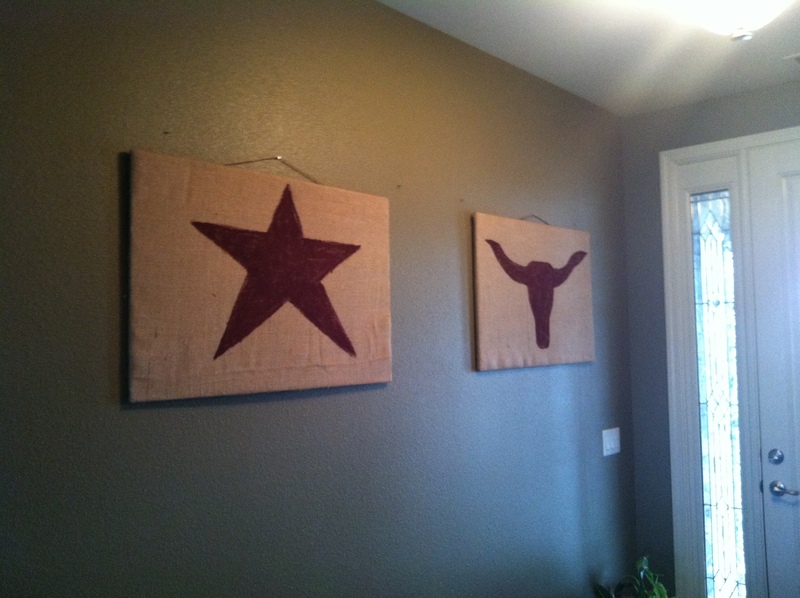 I like the longhorn more, the star less. 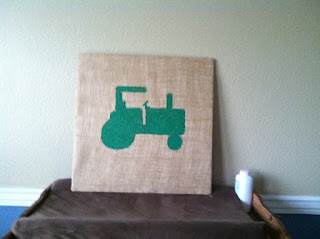 I found some stencils I liked but they were small so I just looked at them as a guide and free handed the drawing. That is why the star is funky. The star will probably get replaced before too long. I need a table underneath, but I need to find a cheap one or con my mom into making one. I decided to do a smaller one for the kiddo's room. He loves it. On all of these I used old foam board from posters at a meeting. Canvas is expensive and I'm super cheap. 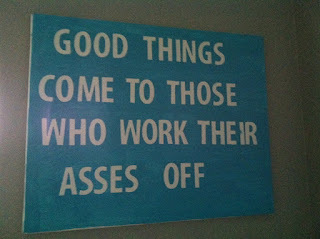 Then I saw those cool canvases with sayings. A search showed me that you could do these by using vinyl sticky letters and painting over them. I did two for my office. Less then $15 for the two of them. I think they are 16x20 each. Then I got all crazy with some furniture. 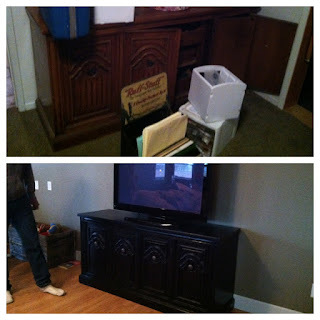 I started with an old credenza a friend was going to take to the dump. I was needing an entry table or a TV stand. It became a TV stand. But it was a ton of work trying to scrape off the varnish. If I had known about Annie Sloan then... Anyway I spent $10 on varnish remover and $18 on ACE's best paint. Took almost a week between all the steps. And the paint isn't going to hold up well to my toddler. But that gave me the idea to give an old dresser of Dad's a makeover - in aqua! I love it. It lives in the guest room now. But it took lots of sanding and scraping. I wasn't able to paint the top because whatever layer it is just won't keep paint on. But I think it looks cool white actually. Then I was officially hooked and found this night stand at a yard sale for $5. I tried out Annie Sloan chalk paint on it - which eliminates the need for sanding or scraping off varnish - and for 1/4 a pint of $40 paint, I have a cool new nightstand. The hubs isn't a fan of my color choice which is too bad since I had more paint to use. :) But the Annie Sloan paint - rocks! You can find it at some antique stores or look them up online to find a retailer near you. 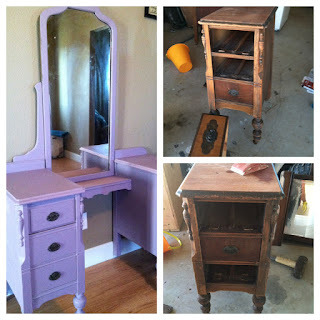 My newest furniture makeover will be a new addition to our bedroom. This vanity has been in my mom's storage/almost junk pile for years. But I've always wanted her to keep it. I've loved it since I was little. 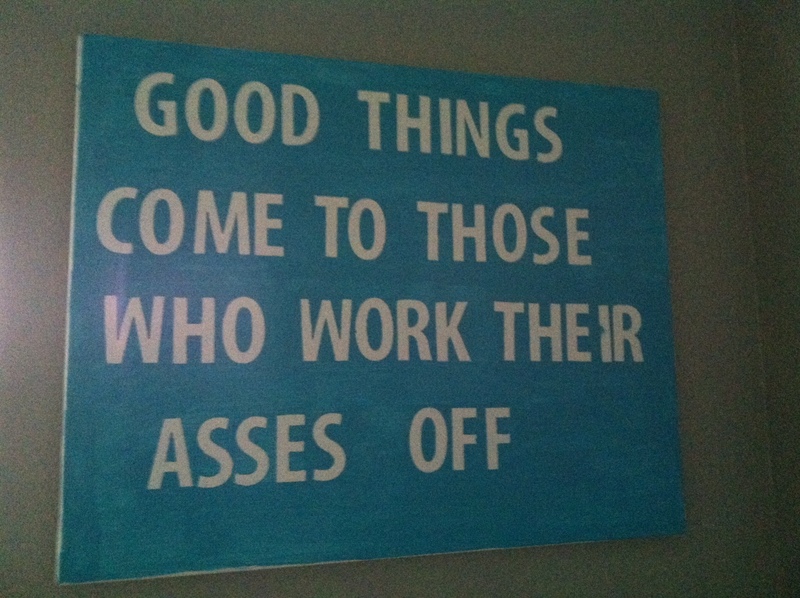 But I never had space for it in my room then or in my houses as an adult - until now. It is super old and belonged to someone in our family. 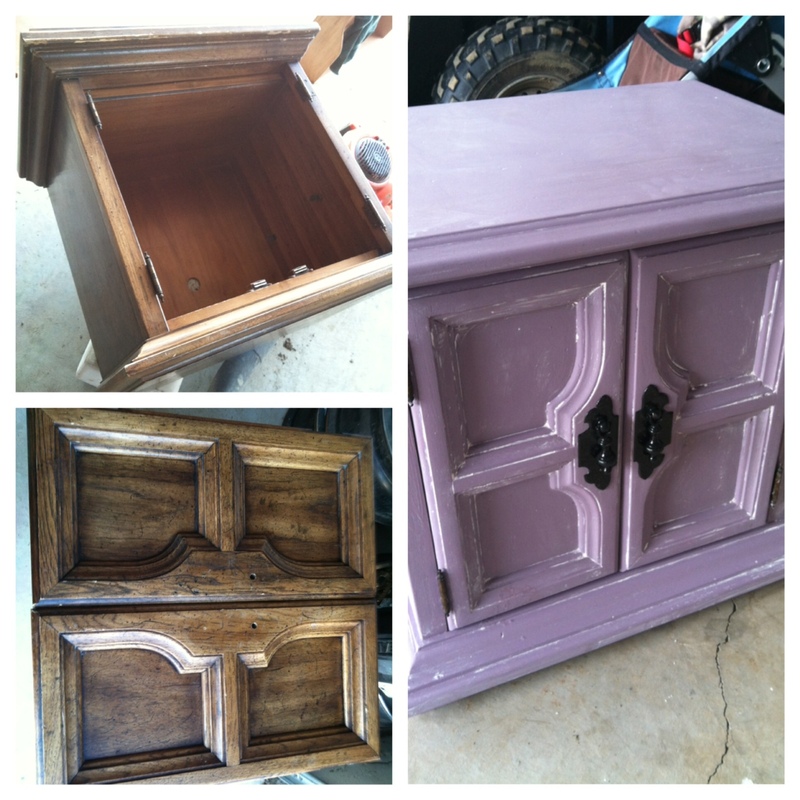 But it was made with pretty soft wood and it hadn't held up well so I couldn't just clean it up and refinish it. So Annie Sloan paint to the rescue and - viola! I have a few more details to finish on it, but I think it looks pretty cool. 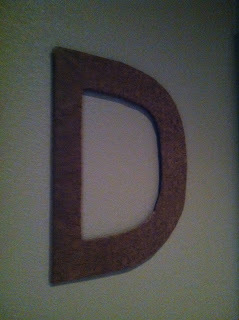 Then I got the idea to use some old foam board (Thanks to my Farm Bureau staff for saving me all those old posters) and make a letter wrapped in rope/twine. Well it took forever to wrap, needed way too much twine and was hard to do the edges. FYI this is almost 3 feet tall. So then I saw some cool faux tooled leather fabric and used it to cover the foam instead. I think I might add something still, but looks pretty decent for only costing about $6 to make. This at the end wall in our hallway. I even got inspired to take an old chair in to get reupholstered. I went a little crazy with my fabric choice when she showed me the bargain fabrics. I can't wait to pick it up and show you all what it looks like! cute projects!! 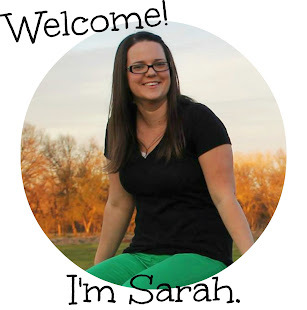 I love Pinterest for all the great projects! Nice job Shannon!! 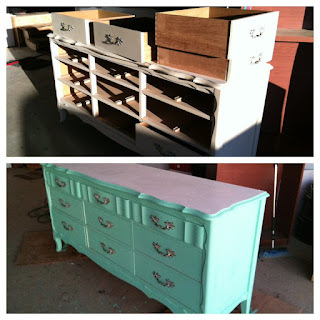 I need to try that chalk paint! Sounds expensive, but if you don't have to sand it would be worth it!